Oxagile helped a major horse racetrack deliver a highly scalable multiplatform video solution under a very tight deadline of 2.5 months. Users can access multi-camera live streams and on-demand content, view a detailed schedule of races and training sessions, and set up notifications to keep up with favorite events. Client: a historic horse racing venue with hundreds of thousands of annual visitors. Tight deadline. As the client chose to align the launch with the main racing event of the year, a fully-fledged solution had to be delivered in under 2.5 months. Top performance and user experience on all screens. To ensure outstanding performance across multiple platforms, the solution needed to provide seamless video delivery on vastly different devices at the same time. At the negotiation stage, Oxagile demonstrated its ability to expertly tackle every concern the stakeholders had prior to development. Proven ability to manage harsh deadlines. To prevent delays, Oxagile’s team took a proactive approach to elaboration, working out detailed requirements, describing system architecture, business logic, and the product’s functionality. Deep expertise in multiplatform video software development. 10+ years of delivering end-to-end solutions for live streaming and VoD, products for Smart TVs, and digital media players highlighted Oxagile as the vendor of choice. Early into the project, the team started delivering value in the form of potentially shippable product increments that heightened the client’s confidence and enabled them to visualize progress. Building on the results of a thorough elaboration phase, a well-coordinated team of designers and frontend engineers rapidly created appealing prototypes and mockups for the Roku, Apple TV, and Amazon Fire TV applications. To let the client monitor production and ensure that all parties remained on the same page throughout the project, Oxagile implemented a transparent and predictable Scrum process and appointed a Certified Scrum Master to head the team. Close collaboration with the client allowed the team to effectively plan sprints, promptly deliver product demos upon the client’s request, and receive valuable iterative feedback. The developed solution comprises a host of visually rich and powerful multiplatform apps and a comprehensive backend with VoD functionality. The native applications for Apple TV, Amazon Fire Stick, and Roku ensure hassle-free access to live streams and on-demand horse racing videos. The team architected a highly scalable Elastic Beanstalk-powered backend with 24/7 load monitoring and dynamic load balancing. Furthermore, the integration of top-class CDN services from Akamai and Streamroot made it possible to deliver live and on-demand content equally smoothly. To boost video delivery and enhance performance across all platforms, the backend developers built a robust content delivery layer, integrating Akamai CDN, AWS Elemental Live, and Streamroot. These services constantly communicate with each other, the backend, and the apps, enabling users to seamlessly access simulcasts and VoD content from any device. 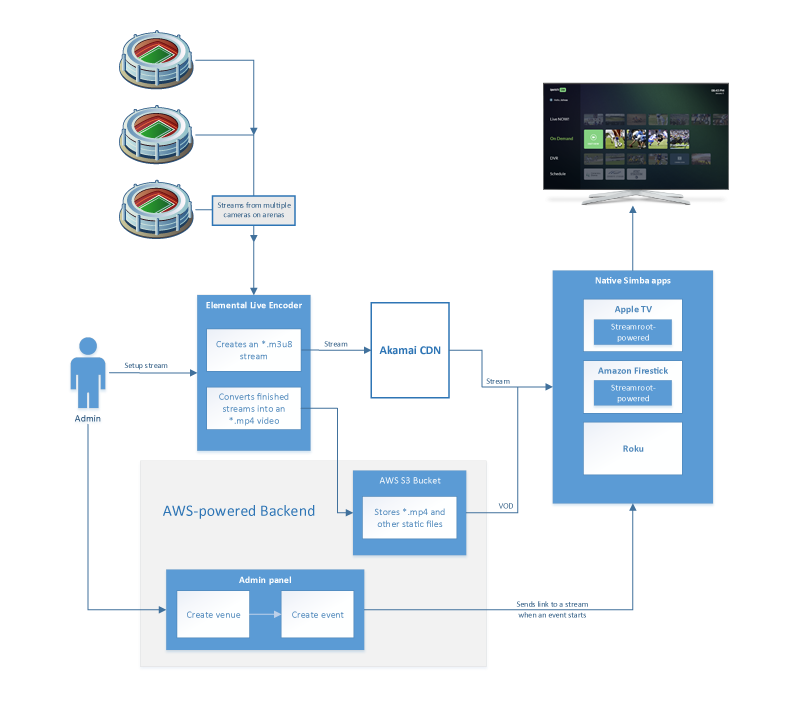 AWS Elemental Live transforms video signals from the stadium cameras into HLS video streams and converts finished streams into the MP4 format for on-demand access. Akamai CDN and Streamroot synergize to route network traffic, balance the load, and deliver high-quality videos at scale. The Roku Channel Store sets tight restrictions on the application’s texture memory, prohibiting channel owners to upload more than 20-60 MB (depending on the Roku device model) of image data to the Roku application. This constraint presented a problem, as the client regarded high-resolution photos one of the chief selling points of the future solution. To address the challenge, Oxagile’s specialists implemented a custom AWS Lambda function to convert pictures from full HD to appropriate resolution thumbnails on-the-fly. During a new image upload, the Lambda function instantly creates a thumbnail of the image and sends it to the corresponding Roku S3 folder. When the Roku application requests the image, the backend responds with a thumbnail and the texture memory bottleneck doesn’t occur. This approach allowed the team to successfully address the challenge in a quick and cost-effective way, without having to change the backend logic. The client was impressed with the quality of deliverables, the development speed, and the complete transparency of Oxagile’s Scrum process, which was instrumental in hitting the market with a fully-fledged product in just 2.5 months. With the performance and scalability requirements fully implemented, the solution boasts a lightning-fast UX and a compelling UI designed to keep users coming back. The native apps are already available for download on Apple Store, Amazon, and Roku Channel Store, and the client is positive about continuing the cooperation and extending the apps with the new features. The team’s technical excellence takes you halfway to success. At Oxagile, we understand that a solid grasp of your business domain is equally critical.